My Integrated Marketing Communications class writes an almost-weekly marketing communications blog. My goals are to teach the blogging medium and business writing skills. I promised to write 500 words with them every week. Here’s my first post. The topic is my favorite thing. I assign this topic to have my students market it across the IMC spectrum. Today they’ve created a content marketing piece for it in WordPress and will personally sell their item in class. Later in the semester we will create print mock ups and prescribe the magazine choice, ad size, and location within the journal. By the end of class, we’ve fully explored all aspects of IMC in the metaphor of a small, personal object. The word of mouth is incredibly powerful. The only rule it that the item must be portable and something they could actually sell. Handmade objects are difficult, so I advise they choose something they know intimately. I want to hear about why this object is truly a favorite thing. 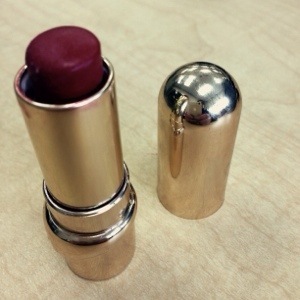 My favorite thing, this semester, is my Julie Hewitt lipstick. It’s not the shiny case that attracted me, although it does possess an 80s glamour. My brow artist who works wonders with my prolific eyebrows sells the Julie Hewitt line in her shop. I’ve always used my hometown brand, Aveda, because I like it’s minty-ness and sustainable packaging. In many years I’ve never thought of changing brands. I am Aveda loyal. However…the colors change and I’ve had more than one Juut make up artist suggest a truly ugly color for me. Ugly, like coral orange. It’s not that coral is an ugly color, but with my skin tone it looks awful. Julie Hewitt sells gorgeous blue-tinted reds and pinks. I have exactly three shades: Femme Noir (pictured above to the left), Sin Noir (not for class) and my go to favorite, Scarlett. First of all, I love color. I consider red, purple, and fuchsia almost as wardrobe neutrals. I wear brown and black, as well, but I also wear something colorful. My purses are black or bright. My hats are the same. I often match my lipstick to what I’m wearing. My red and white herringbone “statement” jacket matches my Julie Hewitt Femme Noir lipstick perfectly. I don’t wear a lot of makeup — usually just tinted sunscreen and lipstick, maybe a little eye liner now and again. The unibrow is not in style. I really don’t think it ever was. Thinking positively, having full brows means my eyebrow stylist can shape them easily without requiring me to fill them in with additional color. I trust her judgement implicitly. My stylist recommended Julie Hewitt. I was hooked ever since..
← My hot is your warm, my warm is your freezing.